Lake Harris is also called Wedowee Lake due to the nearby town of Wedowee, Al. It is situated in northeast Alabama where the Big Tallapoosa River and The Little Tallapoosa River join at mid lake about 5 miles from this small town. This is Alabama’s youngest Impoundment with R L Harris dam completed about 25 years ago. By comparison to other Alabama man made impoundments, this is not a big lake. It is only 27 nautical miles from Lake Harris dam to the lakes headwaters. But it is still a rather spread out lake with 10,660 acres of surface water. This lake does not receive a lot of fishing pressure maybe due to the fact it is so far from a major suburb city. Although it is situated close to a small Alabama town (Wedowee), it is over 30 miles to nearby Anniston, Al. along Interstate 20 going from Birmingham to Atlanta. Nearby, Logan Martin Lake on the Coosa River System and Lake Martin situated down stream of Lake Harris on the Lower Tallapoosa River, both get a whole lot more attention from Alabama’s anglers and constant recreational use. Lake Harris was stocked with more than 135,000 largemouth bass when impounded in 1983. Prior to impoundment there was already a good population of native largemouth bass that already existed in the waters of the big and little Tallapoosa rivers. Some big bass that were previously in small ponds, lakes and creeks. All of which was inundated when the lakes backwaters were flooded. As the lake rose when impounded it covered up the previous homes of these bass. These rivers and small bodies of water also held other fish species including the Tallapoosa breed of spotted bass, lots of crappie, bream, minnows, crayfish and catfish. All of which when combined is the perfect recipe for creating an excellent bass fishery…much better than any angler could ever have imagined. Huge, trophy sized largemouth bass! Just five years after impoundment Lake Harris started exhibiting phenomenal catches of big, largemouth bass. Hundreds of five pound plus bass were recorded being caught by about every angler that bass fished Lake Harris in the mid-to-late 1980′s. Soon, big trophy sized largemouth bass (those exceeding that almost magical mark of 10 pounds), started showing up. Not just a few 10 pounders here and there each month, but weekly, several bass over 10 pounds were reported being caught or weighed in at nearby tackle stores. It got even better. Bass in the “teens” became common and soon the word got out, “Lake Harris has monster bass”! Although it took almost 10 years to build this lake, it did not take half of that time before the anglers of Alabama and surrounding states started showing up. Word soon got out, not only in Alabama but throughout the south, especially when three largemouth bass of near state record (over 15 pounds) proportions were caught. Including an unfortunate bass that had obviously lived out its entire life, a huge bass exceeding 17 pounds, found deceased and floating in the lake. Since the lake was impounded its been about 25 years of anglers seeing the ups and downs of a new impoundment. The locals tried to keep it a secret, but once those huge bass started appearing it was out of their hands. Today the numbers of largemouth bass exceeding 10 pounds has decreased. Often, you will hear of an angler catching one. Maybe a 13-14 pounder. But what has happened to all those bass in the “15 pound plus” weight category? They are still there, but maybe fishing pressure and the lake going through good and bad cycles has contributed to the plain fact. Maybe even pollution. 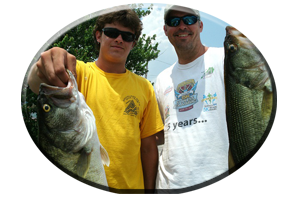 Still, Lake Harris is one of the best lakes in Alabama for fall, winter and spring trophy bass fishing and as they say, ” a young or newly impounded lake always has a sudden reoccurrence of excellent bass fishing about every 5-6 years. ” We are due. So today, you could assume bass anglers are due again for a chance of landing a possible state record size largemouth bass. There is actually a 6 month period, from fall into the winter season and continuing on into the spring of next year, for actually hooking into the bass of a life time. Records show most really huge largemouth bass (those in the teens), are taken from January through March. These are late winter bass to prespawn bass. Big female bass usually feeding heavily and constantly fattening up for the rituals of spawning, in the spring when they will eat very little for almost 30 days. These are catchable bass and these bass are susceptible to a whole range of lures fished in all depths on Lake Harris. Choosing the correct lure, fishing it in the right manner, in the right depth of water, in the right place, is the recipe for success this fall season on Lake Harris. Many variables will determine your lure choice and your fishing success. Rigging several rods with various types of lures that cover the top, middle and bottom water column will help determine where the most catchable bass are holding on each outing. 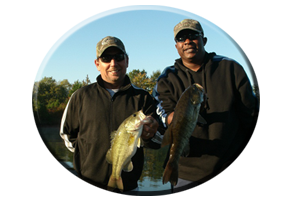 TOPWATER LURES – Its a sure bet if an angler starts out the day throwing a topwater lure (on any day) during this fall season on Lake Harris, he / she may be connect with the days biggest bass. With the lake currently down 10 feet and no weeds on the lake, you can possibly eliminate lures normally fished for their weedless qualities. Still, I have seen lures like frog and rat imitations (normally used in weedy situations), work just as well around Lake Harris wood cover and rock cover, especially during low water periods on this lake when these bass are more concentrated in a much smaller lake. Wood cover is very evident, with standing timber, brush, stickups and stumps, all left here during impoundment, still standing today. With the lake normally down from 10-15 feet during the fall period for winter pool, it looks like you are fishing a forest. 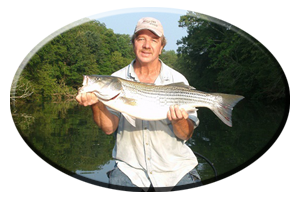 When casting your lures among all of this lure grabbing wood cover use precise casts. Topwaters like zara spooks, Sammies, pop-r’s, the spittin’ image, the poppin’ image and baby torpedoes (with dangling, wood grabbing treble hooks) should be fished with precise casts during this fall and winter period to avoid frustration or losing lures. When the lake is down it also exposes lots of previously submerged cover. Topwaters, like just mentioned, fished out in open water get strikes from suspended bass holding out in deep water. These can be schools of spotted bass as well that have grown to trophy size bass over the past 25 years. Keep a big heavy topwater lure (like a zara super spook with 3 hooks), rigged and ready for these schools of bass can erupt at any time during the fall and early winter season. If looking for a more weedless topwater lure try noisy clacker type buzzbaits, that feature one upturned hook. They cast long distances, are very weedless and wind resistant and buzzbaits can be made to weave through all the wood cover. Another plus is, buzzbaits attract the bigger bass bites! Always include a trailer hook and fish buzzbaits on at least 20 pound test monofilament line or 30-40 test braided line. These lure choices are as many as when choosing a topwater lure. But these lure choices work anytime. Like Spinnerbaits. Choosing your spinnerbaits depends on water clarity. During falls heavy rains the lakes headwaters and the incoming feeder creeks can get stained. At times the lakes mid to upper section and its feeder creeks can get downright muddy. As most anglers know when faced with this situation this is the time to fish with heavier 1/2 to 3/4 of an ounce spinnerbaits. Those models that show brighter colors both on the spinnerbaits skirt and trailers as well are best. Spinnerbaits sporting big, oversized blades are a must, so bring along plenty of blade choices. Spinnerbaits can be retrieved right through standing timber without hanging. They are very weedless and will not hang up unless your casts are not precise and you snag a limb or tree trunk. Spinnerbaits can also be slow rolled or dropped among all this lakes standing timber, for some bass are still holding deep from the hot days of summer and early fall. Crankbaits would be a good second choice lure, if I had to cover the middle water column where a lot of big bass just suspend during the fall and early winter period. These lures fool a lot of bass into striking, usually out of instinct and some big bass as well. Rig three rods, one with a shallow diver, one with a mid diver and another rod rigged with a deep diving crankbait. This will help you determine what depth most strikes can occur from. Colors, lure actions and the way you retrieve these crankbaits may determine whether or not you even get a bite. Experiment and try all types. The same goes for lipless lures that sink and can be fished at all depths. I’ve seen these type of lures like Rattletraps, Vibes, Cordell spots and Rapala’s Rattlin’ Raps work very well on Lake Harris schooling bass and bass suspended in this standing timber. There are times when they prefer small to large sizes so bring plenty of 1/4 to 3/4 ounce lipless type lures. Suspending and floating jerkbaits fall in this middle water column. Although most jerkbait models only dive less than 5 feet deep they are excellent lures for triggering bass that ignore other lures. 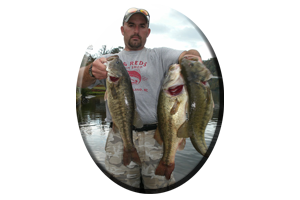 Fished with a fast, erratic stop and go retrieve, fishing jerkbaits can show these bass follow these lures and often hit right at the boat…so be ready! Always use 14-17 pound test line on your crankbaits and jerkbaits. Boy, how long of a list would this be? When choosing lures that you generally drag along the lakes bottom this fall season there are many lure choices, lure colors and various lure shapes, sizes and actions these bass may prefer. Water clarity, water depth, the time of year you are fishing and the type of cover being fished should determine your lure choice. Also what are you wanting to catch? Lots of small bass or fish all day hoping for just one big old monster bass? The choice is up to you and yes, bigger is always better when faced with this decision. I would rather cast a big lure all day, that fills a bass’s belly fast and gets its eating interest, rather than fish a smaller offering, usually resulting in getting lots of bites, but generally from smaller bass. So here’s a few choices. Worms – These slithering creatures have fooled a lot of bass over the last 25 years on Lake Harris. Small worms work very well especially in clear water situations or when following a cold front, when bass are more picky and usually full. Even small 4 inch finesse worms fished on light tackle outfits have fooled some big bass into striking on Lake Harris. Problem is many of these huge, tackle testing bass are not landed. The timber, rocks and bottom can damage your line nicking it and causing a big strong bass to break it. So heavier outfits are recommended. Big worms fool the bigger bass. Worms in lengths of 10-12 inches, fished on a 4/0 to 6/0 hook with a 1/4 ounce to 1/2 ounce Texas rigged sinker have fooled a lot of trophy sized bass on this lake. They still work today. Always sharpen all hooks and bring plenty of worms, hooks and sinkers. Lizards, tube baits, creature baits and jig combos come in small and large sizes and they fool these bass on bottom this fall season on Lake Harris. Looking for a real, trophy sized bass this fall and winter season? Always call on Reeds Guide Service…first! ” Fishing, guiding and exploring all of Alabama’s lakes for over 40 years,” including Lake Harris, since it was impounded. Remember, a guided fishing trip with Reeds Guide Service makes a great gift for Birthdays, Fathers day and Christmas (certificates available), for those loved ones that love to fish. Several qualified guides and boats available year round for multiple parties and corporate guided trips.